First grad school, then starting a business, then keeping up a business, along with the trials and tribulations of work, relationships, and travel, I’ve created an awesome, but rather unbalanced life for myself. That’s been the choice- to allow a tipping of the scales. But that kind of thing can’t persist continuously. Burnout ensues. So over the last year, I’ve put energy into other spheres of my life- returning to a regular yoga practice, doing volunteer work, and nourishing my life here in Tucson, at home. While I haven’t achieved quite what I’d call a balanced life, I’m well on the way, and really stoked about that. The journey is really beautiful. Financially, that journey is challenging, but that’s ok. Bumpy roads are more interesting and enjoyable anyways. This weekend brought big steps along that path, probably ones more significant to me than it would seem to others. While in t he last 6 months of grad school and all of the anxiety that came with it, my large collection of desert succulents went dormant, or died, entirely due to the fact that I stopped watering them. It’s funny how that works… I guess plants need water in the desert. And it took this long to decide to bring those plants back… So with the generous help of friend Audra and her plethora of well-loved (translation: watered) potted plants, we refilled a few empty pots with clippings. Surprisingly, quite a few of the old succulents survived the MZ-induced 5 year drought, and in the last 24 hours, these have already perked up a bit. 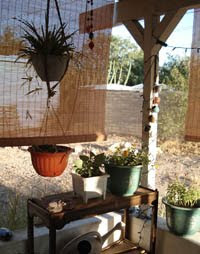 We hung blinds to shade the porch, which is awesome for me and the plants, preventing a little bit of future water loss, and providing some shade from this intense Arizona sun. It gets better… Monday morning, inspired by Sunday’s successes and a vi sit to my yoga teacher’s lovely garden, I took the first step toward a *real* garden at home... 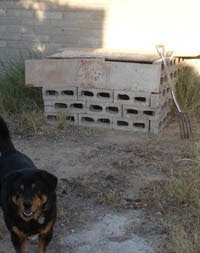 I built my very own compost bin. Made with cinder blocks found behind the shed, and a few random pieces of wood, I’ve started making scrumptious nourishment for all the delicious vegetables I’ll eventually grow. It’s very exciting. At least for me. The compost bin is far from glamorous, but it works. It’ll be quite a while before my compost bin is generating usable compost, but I’m jazzed regardless. On a break from the torch today, I ducked outside and peeked in the bin, half-hoping magical composting garden fairies had snuck in and transformed the few grass clippings and veggie scraps into beautiful humus. Alas, no fairies (at least that I could see... microbes are working their fairy magic already), just a few ants and a grasshopper, which is almost as good. Fairies hate to be spied on, so you'll just have to be patient! I'm hoping to set up a compost bin soon, too. I hate throwing away all of that vegetable waste. We compost, and it is a beautiful thing. Put your hand in the pile of decomposing green matter. If it is working, it should be quite warm, if not hot!. (fairies like it warm, that is why they are so plentiful in the desert.) Watch out for the weird white grubs..... they bite.